Succinctly and correctly format statistical summaries of various models and tests (F-test, Chi-Sq-test, Fisher-test, T-test, and rank-significance). The main purpose is unified reporting of experimental results, working around issue such as the difficulty of extracting model summary facts (such as with 'lm'/'glm'). This package also includes empirical tests, such as bootstrap estimates. Polish Binomial work a bit. Fix end conditons of differnce of binomials. More interfaces to Binomial test. Fix pre-formatting on FTest (though this may not be not the pattern we want to user later). Fix "not connected" options on TTest and others. Pass more arguments to tests. Switch to own Cohen-d estimate. Make sigfig a bit more flexible. Add lm() anova wrapper wrapFTest.anova(). Add glm(family=binomial) anova wrapper wrapChiSqTest.anova(). 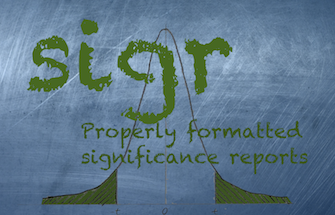 Some statistic presentation sigfig fixes. Fix NA warning bug in wrapChiSqTest.data.frame. Enforce more types in calculations. More standard (data.frame plus column names) interfaces. Default to independent samples in resampleScoreModelPair.